Millington, TN (April 30, 2013) As the Summit Bracket Racing Series presented by COMP Cams progresses throughout the season, the current points leaders in each class are emerging, but it still anyone’s game. The point’s leaders in Super Pro, Pro Footbrake, R.T. Turbines DOT and R.T. Turbines Jr. Dragster classes at the end of the season earn the opportunity to participate in the IHRA Summit Racing Equipment Team Finals October 4-6 and possibly the IHRA Summit Racing Equipment World Finals October 11-13 both hosted at Memphis International Raceway. Sunday, April 28th may have been a reschedule date for the Summit Bracket Race presented by COMP Cams originally scheduled for April 27th turned out to be a memorable night of racing for the Ferrell family. Buddy Ferrell from Brighton, TN took the win in the Super Pro Class over his son Jason Ferrell by .002 seconds. Buddy Ferrell with .006 second reaction time, 4.83 dial in time, 4.846 ET at 140.37 mph. Jason Ferrell with .014 reaction time, 6.21 dial in time, 6.226 ET at 109.01 mph. Congratulations to both for a wonderful race. Greg Rushing from Jackson, TN received the automatic win in the Pro Footbrake Class over TJ Tracey who was -.019 seconds too fast from the line. Rushing finished with .019 second reaction time, 6.91 dial in, 6.899 ET at 98.20 mph. Jimmy Ray from Atoka, TN took the win over Cliff Hubbard from Millington in the R. T. Turbines DOT Class. A night which included a special “double purse” sponsored by R. T. Turbines in a program that is building week in and week out. Ray and his ’65 Malibu finished with .027 second reaction time, 10.54 dial in, 10.499 ET at 124.94. Hubbard finished with a .067 second reaction time, 14.91 dial in, 14.817 ET at 92.63 mph. In the R.T. Turbines Junior Dragster Class – Winner Justin Poindexter from Millington, TN took the win over Clay Combs from Bells, TN. Poindexter finished with .071 reaction time, 8.01 dial in, 8.013 ET at 76.97 mph. Combs close behind with .059 second reaction time, 7.95 dial in, 8.117 ET at 79.95. 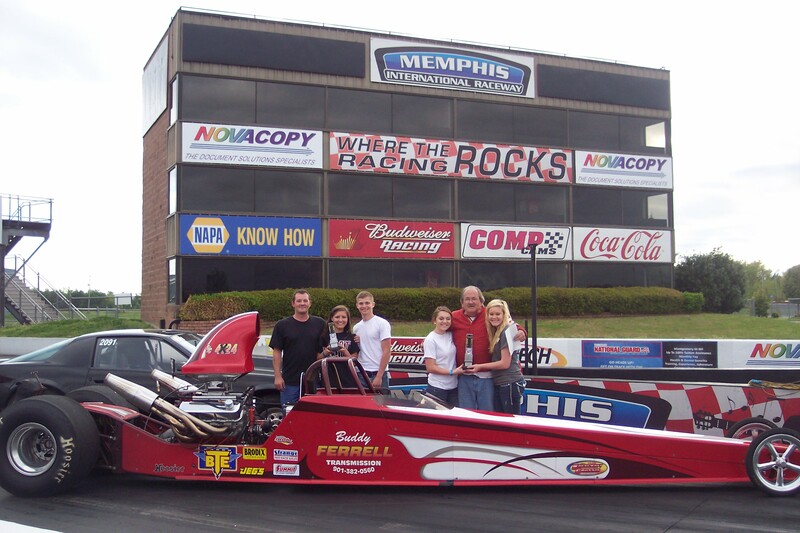 Memphis International Raceway is a multi-faceted venue and one of the most popular raceways in the Mid-South for racers and spectators alike. As a leader in its operating form and function, MIR seeks to provide its drivers with a higher level of challenge, excellence and opportunity. MIR boasts three complete tracks, including a high-performance road course, an historic drag strip and a 3/4 mile paved tri-oval. The 1.8 mile road course features fast and challenging corners all set up by long straight-a ways and is considered one of the most competitive in the Mid-South. MIR is sanctioned by the International Hot Rod Association (IHRA). The IHRA is one of the largest motorsports sanctioning organizations in North America and is a leader in sports entertainment. For more information on MIR, please visit the venue’s website at www.RaceMIR.com like us on Facebook at www.facebook.com/RACEmir and follow us on Twitter at www.twitter.com/racemir.